Pheonix, AZ - Saint Sava, that “most beautiful Serbian child” as St. Bishop Nikolai of Zicha had once said, is celebrated during these days throughout the world, wherever Serbs live. 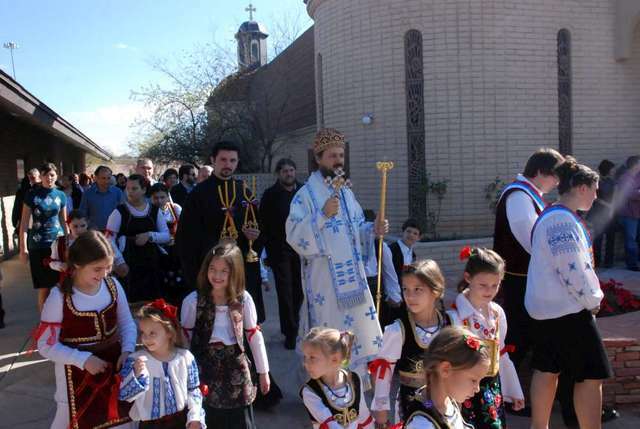 The Serbian community in Pheonix has St. Sava as their patron and on Sunday, January 25, 2009 they formally celebrated this feast. Bishop Maxim of Western America made an archpastoral visit to the community and officiated at the Divine Liturgy, assisted by host clergy Fr. Janko Trbovic, and visiting Fathers Dusan Vavic and Stanislav Duric. The Litya and procession around the church followed the liturgy with responses sung by the parish choir. Many children and youth took part in the celebration. Joining the parish for the St. Sava celebration was the neighboring St. Nicholas parish, led by Fr. Stanislav. The cutting of the Slava Kolach and the children's St. Sava Program was held in the hall.